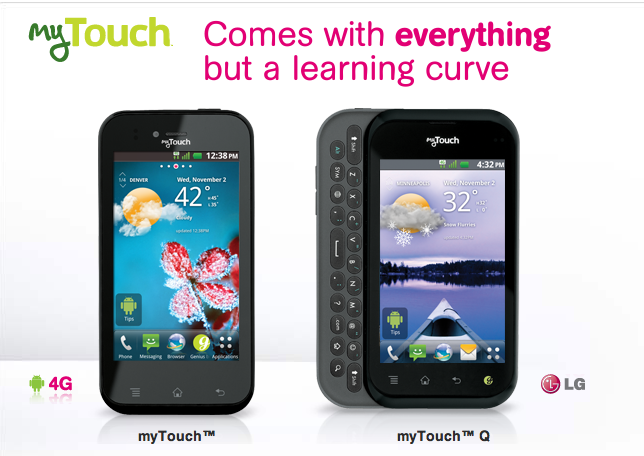 Are you looking for more information on T-Mobile’s newest myTouch by LG signature devices? Well good news for you as the official myTouch website for the new LG smartphones is live and you can sign up for more info and check out some video action. Of course we have a pretty good indication as to when these devices will launch but it never hurts to sign up and let T-Mobile tell you for sure. We’re eager to learn more about the newest devices in the myTouch lineup especially the type of 4G speeds on board, internal storage and more. While we work to uncover the answers to all of these questions and more we’ve embedded all the videos below for your viewing pleasure. All the videos come up as autoplay so instead of embedding the vids just hit the link below to see them all. These phones look good for entry lever smartphone people. Hmmm all I can say is I hope LG learned there lesson and TESTED their devices extensively before releasing them out. If they haven’t learned from the G2X fiasco, I don’t know what to say. I know unfortunately for me with my experience with the G2X it will be a long time before I consider LG for another smartphone. I’ll be looking at HTC or Samsung for my next device. After lg fixed the G2x it became the smart phone that I would say had the least issues. I would always suggest it to customers who want something easy to use and didn’t have many issues. Well that must be purely from your experience. Mine supposedly “got fixed”, like with the Gingerbread update & I’m still having the same issue. I got 2 replacements with Gingerbread & still the same issues, freezing, lagging, rebooting itself, then a new issue where it one time called people from my call log. I would say the G2x is the smartphone with the most issues from my experience, personally. LG hasn’t fixed it yet. Most problems are gone, but some remain. Bluetooth, for example, still doesn’t work right. LG used to be GoldStar…manufacturers of the crappiest products imaginable. Some things never change. Ok that’s enough myTouch phones for a while. Think they just tarnished a good line of phones going to LG, they look cheap. I just hope they retain the MT4GS long enough that I might just be able to grab one. Ok T-Mobile stop trying to shove andriod down my throat and show me frac’n WP7.5 love. Where the frac is the HTC Radar?? How ’bout annoucing some additional WP7.5 handsets. Enough of the frac’n andriod crap. As much as I like Android, I am quite interested in the HTC Radar. T-Mo just threw out a press release and then forgot about it! Hopefully they’ll have both colors available. I’d have imported the thing already but the unlocked version does not rock the AWS 1700 band (yes, I have contacted HTC to make absolute sure). Windows phones don’t have many issues except they aren’t fun to use… They are just pretty to look at. 3.3 hours of talk time? Um . . . no thanks. hate this phone its not HTC. i wuoldnt pay a nickle for it. i prefer stay with mytouch 4g real one not fake model. I DON’T CARE ABOUT THESE CRICKET LEVEL PHONES, I WANT THE IPHONE! When you receive a message on your phone from the carrier saying, Welcome to AT&T family. That day you will know that you can get the iPhone after kissing At&t’s outrageous and expensive plans. I too am dissapointed that HTC is not making the new myTouch. I will say from having had the opportunity to test these devices that they are well aboce par for “entry level” Android devices. I have LG MyTouch and its an awesome phone. 12+ hour battery life and a great keyboard and I was upset to find out that they aren’t making an otterbox for it.